Whenever you want to give a boost to your health and enhance energy, just grab a bowl, pick some fresh fruits and let your imagination go wild. 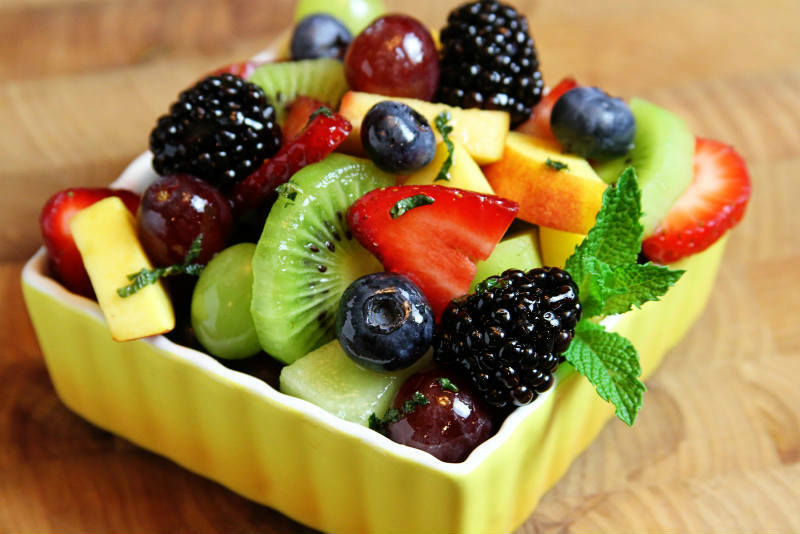 Give your body the natural treasure it deserves with this amazing fruit salad. Kiwis are rich source of vitamin C and they contain almost the same amount of Vitamin C as orange does. Vitamin C is essential for metabolism and production of energy. Its regular intake maintains good health and provides many benefits for body organs. In addition, it is an excellent support for healthy weight loss as it suppresses appetite and assists in weight management. Furthermore, kiwis abound with vitamin K which is important for formation of proper blood clots as well as for the maintenance of strong bones and prevention of osteoporosis. The introduction of kiwi to this fruit salad adds a dramatic tropical flavor and gives it irresistible taste. Being low in calories and high in fiber, berries are regarded as magnificent immunity booster due to the presence of vitamin C which protects the body from free radical damage and infections. Moreover, vitamin C is essential for the production of serotonine, a neurotransmitter responsible for enabling good mood and excellent brain function. Vitamin C is crucial for anti-inflammatory effects and it is a powerful weapon against many diseases and certain cancer types. Peach is a great source of vitamin A and C, while mint has a considerable amount of vitamin A, necessary for healthy skin, good vision and immunity. Mint is used in this salad in order to add a specific taste and to promote good digestion. Cut the kiwi into slices however thick you like, chop the peach into medium-sized chunks, cut the strawberries and add the remaining berries in a bowl. And at the end, chop finely 2-3 fresh mint leaves and toss them over the fresh fruit pieces. Combine the two ingredients by stirring them well and pour the dressing over the freshly prepared fruit salad. At the end garnish with fresh mint leaves. Note: Vegans should use only the orange juice for dressing.